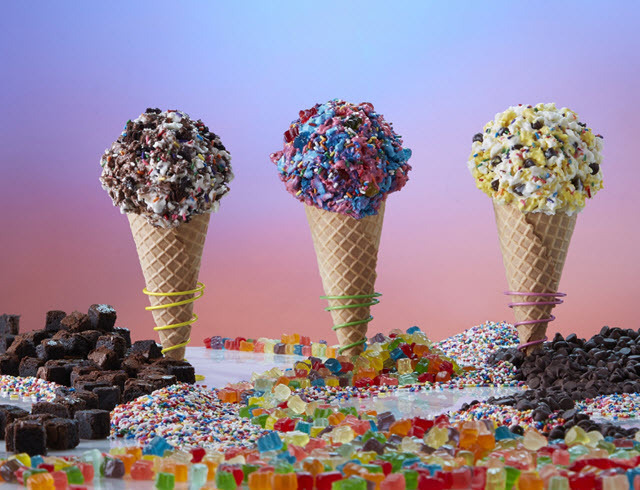 Marble Slab Creamery has launched ice cream treats inspired by the popular Candy Crush mobile game from King. The three treats include Chocolate Mountains, Candy Clouds and Marshmallow Surprise. They are available in cone, cup, shake and cake forms. Chocolate Mountains is made with Sweet Cream and Chocolate Ice Creams with fudge brownie pieces and rainbow sprinkles. Candy Clouds contains Cotton Candy Ice Cream with Raspberry Sorbet, gummy bears and rainbow sprinkles. Marshmallow Surprise features Very Yellow Marshmallow and Sweet Ice Creams with chocolate chips and rainbow sprinkles. Marble Slab VP Allison Lauenstein says in a statement, "Like the Candy Crush franchise games, Marble Slab Creamery is a tasty fantasy land where customers can use their imagination and cravings to create a memorable and unique ice cream experience – the combinations are endless. Candy Crush is a pop culture phenomenon and our new flavors inspired by the game are sure to take our customers on a delectable adventure."